Available as a kit from SOLsilke or through Susanna Hansson’s class on Bohus Stickning. Originally in Swedish, the instructions have been translated into English by Susanna Hansson. To achieve a gauge of 8.5-9 stitches per inch (2.5 cm), it may be necessary to go down to a US 000 (1.5 mm) needle size. 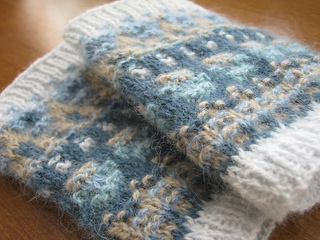 The Blue Shimmer series includes kits for a pullover/cardigan and for a hat/scarf set. Wendy Keele’s adaptations in Poems of Color include options for a pullover, cardigan, jacket, or hat.